FORGIVE ME is now available from Tule Publishing! You can read it on your favourite e-reader, or wait for the hard copies which will be available to order in a few days. If you'd like to catch up on my takeover of Tule Book Club on Facebook on Release Day, you can join the Club and find out more about all their titles, including FORGET ME, the sequel to FORGIVE ME, which will be coming out in June. I'll also be doing a Facebook Takeover of the group Coffee, Cupcakes and Contemporaries on Monday, April 8. Check in there all day for more info about Piper and Lucas and their story! Lucas and Piper are a couple who've been in my head for many, many years and I'm delighted that they are finally getting their chance in the sun! Go to my books page for more info and an excerpt. ​Want my latest news without all the pesky clicking? Subscribe to my newsletter! [Okay you have to click once and then the nice people at Mailchimp will give you the nice GDRP-compliant form. ​I'm an author, mom and British ex-pat. I write contemporary romance and women's fiction about fish-out-of-water characters who find home where they least expect it. I love living in my stories, my husband and kids and being covered in white fur (not always in that order). Come and have a cuppa. I'll make the jam tarts. 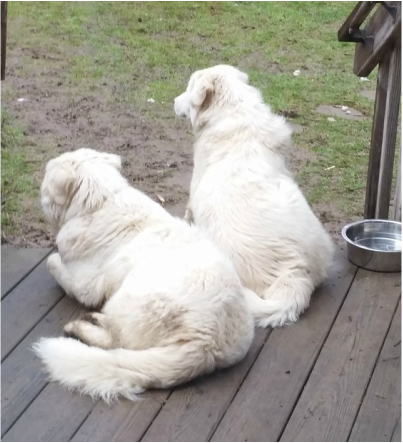 The dogs will keep a lookout.